Students in our Gooseberry classroom are older 2’s. In our Gooseberry classroom students are given the one on one attention that significantly aids in their social and academic development. During circle time students learn concepts such as number sense and literacy skills. 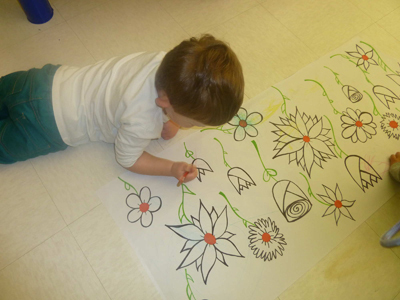 They continue to increase their fine and gross motor skills through various activities throughout the day. Being assertive to their preferences and saying, “no” to adult requests. Show awareness of their own feelings and communicate them to others. Child will be able to understand the differences in sizes and textures. He or she will be able to differentiate between large and small, short and tall, soft and hard. Child can tell you his or her name, as well as be able to identify some colors when asked. Child loves to engage in pretend and make believe play.